Kottayam: Lack of coordination between government and rescue forces have hit evacuating stranded flood victims even as 30 persons died in different incidents across the state today taking the toll 90 since August 9. Eight people died in landslips in Nenmara in Palakkad and five in Thrissur, eight in Malapuram and two in Kozhikode and elsewhere. Train services have been suspended as Periyar and Chalakudi rivers are flowing dangerously under the bridge. CIAL airport at Kochi is not likely to open on Saturday as announced earlier. Water had entered the airport and many key areas inundating aircraft. Thrissur -Coimbatore highway is blocked due to landslide at Kuthiran creating 15 kms vehicle block including cargo lorries. Munnar, Wayanad and Pattanamthitta are marooned. Tourists are stranded in many areas. Patients were evacuated from many hospitals where water entered in lower floor in Aluva and Pattanamthitta. In Pathanmthitta 80 patients were stranded in a hospital. 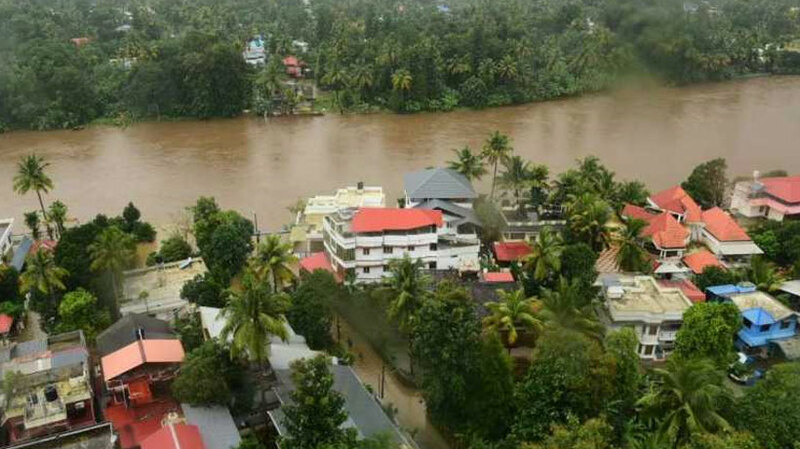 Worst affected areas were on the banks of Pambayar in Pathanamthitta and Periyar in Aluva. Water from Idukki dam, Mullaperiyar and Idamalayar was reaching periyar in Aluva. Water level in Idukki dam wad 2,401 feet and Mullaperiyar at the permissible level at 142 feet. Tamil Nadu has refused to further reduce the height from 142 ft as the supreme court had allowed it to maintain the level. Tamil Nadu Chief Minister Edaladi Palaniswamy said the supreme court appointed expert committee had visited tge dam the other day and found it safe to retain the level at 142 feet. Meanwhile, chief minister Pinarayi Vijayan told reporters that the prime minister , Defence minister and home Minister today assured all help. The centre is sending 40 members of NDRF team, 200 life buoys , 250 life jackets, he said. Army will deploy special forces armed with all necessary flood fighting equipment. Marine commandos will start rescue operations urgently. Air Force is sending 10 helicopter and coast guard two ships.As of now there are ten helicopters in operation. There are 52 teams of different forces of army, airforce and navy are engaged in rescue operations. He appealed to the people to not remain adamant and hang on to their places and instead move away to safe zones. He said water in Periyar river and Chalakudi river is likely to go up by one metre. He sought more fishermen with motorised boats to take part in rescue operations. He said all the 80 dams in the state are open.